Today was the last day of the Faraday Institute summer school (see posts below) and it was devoted to ethical challenges in contemporary science. 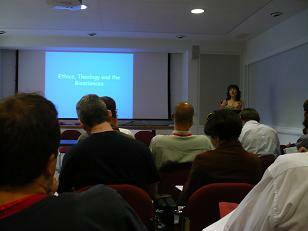 The day started with an excellent overview of the whole area of ethics by Dr Cherryl Hunt of the University of Exeter. Dr Hunt set the stage for the day by explaining concepts such as ethical relativism, ethical objectivism and ethical absolutism. She then went on to discuss the differences between naturalistic, utilitarian and deontological positions in an ethical context. – human improvement: do we need it? – the mixing of animal and human genes; should we do it? – genetically modifying plants and animals: is it dangerous? Dr Hunt addressed each of these in turn. She also discussed another dilemma, the ethics of environmental challenges. Going over the different positions of many religions, she contrasted the ‘dominion over the earth’ viepoint with that of the ‘stewardship of the natural world’. This was a fascinating talk and you should be able to get the slides and video on the Faraday Institute website in a few days. This was followed by a quick review of landmarks in modern genetics such as recombinant DNA (1972), transfer into E-coli (1973), first genetically modified animals (1976), first genetically modified plants (1983) etc. Then followed a detailed discussion of animal-animal and human-animal gene transfer. I won’t give details, but I particularly enjoyed a discussion of GM foods. A familiar issue here is the pubic misunderstanding of science: the public distrust of GM foods is in marked contrast to the scientific consensus, making it very difficult for GM technology to progess. After lunch, we were treated to a very different sort of lecture:, a lecture on the nature of personhood and the ethical challenges raised by medical technology, given by Professor John Wyatt, Professor of Neonatalogy at University College Hospital London. On the other hand, Prof Wyatt explained that, in the same hospital , many parents are offered the option of abortion for babies with handicaps or deformities. In particular, about 90% of unborn babies with Down’s Syndrome are aborted, a truly shocking statistic. Given that it is often the same doctors, you can see the ethical maelstrom. This issue is set to get worse, with the onset of pre-natal tests which may give a full analysis of the DNA of unborn child.. There followed a detailed discussion of the nature of personhood, starting with the views of the philosopher Peter Singer. Dr Wyatt showed the weaknesses of the Singer position by considering examples from brain-damaged adults to dementia. He also emphasised the issue of dependence – how it is intrinsically human to be dependent, from the youngest infant to the oldest person-our natural condition far from an abherration. ( ‘We are designed to be burdens!) This was an outstanding talk but I won’t attempt to summarize it further..you can see the video on the conference website or go and buy his book! The last talk of the day was another talk by Dr Cherryl Hunt (see above), this time on the particular subject of the ethics of stem cell research. Starting with simple definitions such as totipotent cells (can make all cell types, can grow into embryo), pluripotent cells (can make many cell types but can’t grow embryos) and multipotent cells (can make few cell types), Dr Hunt explained the huge advantages of embryonic stem cells. She went on to describe the ethical challenges concerning the use of these cells, contrasting the utilitarian to deontological viewpoints discussed this morning. I won’t give a proper review here, but in the discussion afterwards, I was struck by the common sense approach adopted by the speaker and most of the audience, representatives of many religions and none. Essentially, many felt that the fact that nature disposes of about 80% of fertilized eggs for a variety of reasons implies that we should probably not be too absolute in our view of the status of embryonic stem cells. There was also the issue of spares: in IVF, unused embronic cells are routinely disposed of, so is it not better to use them for the good of mankind? 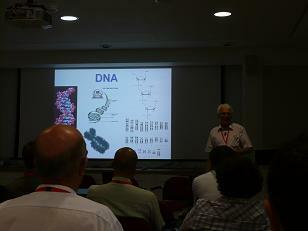 That was the last talk of the conference; again a recording will soon be available on the Faraday website. As on other days, the day’s presentations were followed by a plenary panel discussion of questions raised by the talks. Overall, this was a fantastic week of highly interesting talks, see review tomorrow. Right now, it’s time for the conference dinner at High Table! Note: videos of the talks will be available on the multipage multimedia page of the Faraday website from mid-September only, apologies for misinformation in earlier posts. nice work/reporting as usual… how was last year’s course compared to this? any old timer from last yr besides u? Actually, there were only one or two from last year, it was a slightly older crowd. Hannah turned up on Thursday for the Simon Conway Morris talk. That said, St Edmund’s is really lively at the moment, because there is a gang of Americans here doing a course in political science!